Snowflake Marshmallows are soft and fluffy marshmallows cut into cute snowflake shapes! Gift these with a mug of hot cocoa or coffee for the ultimate holiday present. Or stick them on skewers to make snowflake marshmallow pops, or dip them in chocolate for an even more luxurious treat...the possibilities are endless! 2. Place 1/2 cup of cold water in the bowl of a large stand mixer. Start whisking the water gently with a small whisk or fork, and while you're whisking, gently sprinkle the powdered gelatin on top. Go slowly and stir well so the gelatin is absorbed evenly and there are no clumps. Set the mixing bowl aside while you prepare the sugar syrup. 3. Combine the remaining 1/2 cup of water, corn syrup, granulated sugar, and salt in a medium saucepan. Place over medium heat, and stir while the sugar dissolves. While it heats, stir frequently and brush down the sides of the pan with a wet pastry brush to prevent sugar crystals from forming. Once the mixture comes to a boil, insert a candy thermometer and stop stirring. Cook the sugar syrup to 245 F (118 C). 4. Once at 245, remove the pan from the heat and take out the thermometer. Place the mixing bowl with the gelatin mixture in the mixer and start beating it on slow speed with the whisk attachment. While the mixer runs, slowly stream in the hot sugar syrup. Aim to get the syrup to fall between the sides of the bowl and the whisk blades, so it doesn't splatter all over up the sides of the bowl. Once all of the syrup is added, gradually increase the speed to medium-high and whip for 5-7 minutes, until the marshmallow is very shiny and thick, and when you stop the mixer and lift the whisk up, it falls from the whisk in a very slow, thick ribbon. 5. Add the salt and peppermint extract, and mix briefly to combine. Scrape the marshmallow into the prepared pan and smooth it into an even layer. Let it set and firm up at room temperature for at least 6 hours, or overnight. 6. Sift the powdered sugar with the corn starch. Sprinkle the sugar/starch mixture on top of the marshmallow, and all over your work surface. Flip the marshmallow out of the pan, and sprinkle more sugar on top. Spray a snowflake cookie cutter with nonstick spray, and cut snowflake shapes out of the marshmallow. Periodically stop and spray the cutter again if the marshmallow starts sticking. 7. Toss the marshmallows in the sugar mixture to keep them from sticking together. 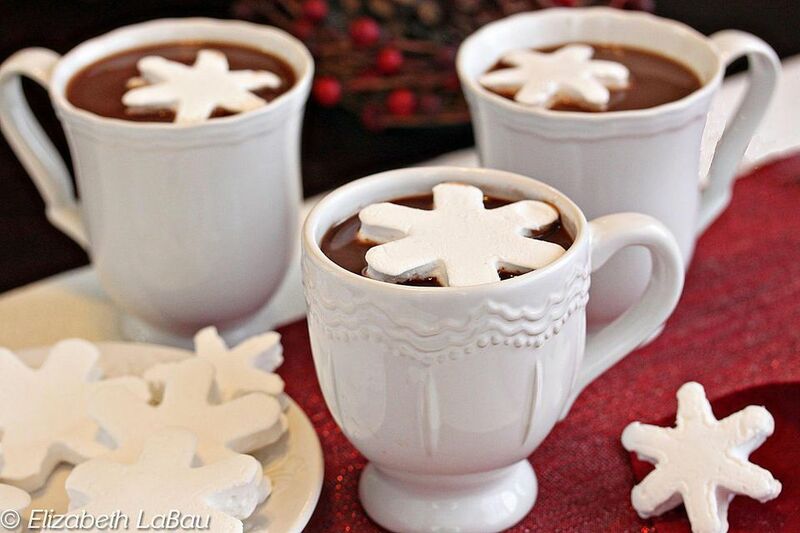 Store Snowflake Marshmallows in an airtight container at room temperature for up to a week.